Roundup: 5 Eco-Friendly Materials for Building The Ultimate 'Green' Kitchen! Curbliers, it's time to get down with 'the green team'! Whether you're remodeling, starting a new build, or just like daydreaming about gorgeous kitchens, we've rounded up our five favorite eco-friendly building materials. Ready to dream green? Let's go! Green cleaning products don't always have to come from your local "Green" grocer. My older sister is a good example of this-- she makes a lot of her cleaning solutions and is in love with the result she gets, both by way of a fresh, clean house and by saving money. Want a few home-made cleaning recipes? How To: Make Natural Dyes from Common Food Items! I learned a long time ago how to dye fabric using fruits and vegetables (thanks to my mom and her degree in "3D textiles": she would dye all her own materials and make sculptures from resin-saturated fabrics... I know, right!?). Alas, the wisdom she bestowed upon me escaped my "vault of knowledge" along with a great many other things over the years. Fortunately, the Internet exists. And extra fortunately, someone decided to show us all how it's done! Ready to start putting those groceries to new use? 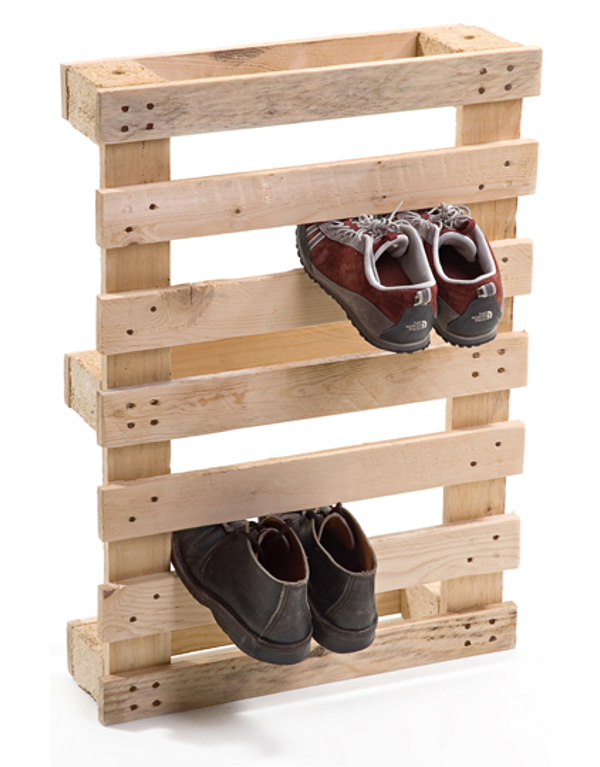 DIY Idea: Make a Mudroom Shoe Rack from Pallets! As with mason jars, there seems to be no limit on what you can do with a discarded pallet. We've shared quite a few projects in the past, but this may be the simplest/easiest of the bunch! We've covered our bases with green cleaning products, ideas for re-using old towels (shaggy-cool bath mats! ), and tips for cleaning out and organizing those pesky junk drawers. But what do you do with all those random items you've cleared out? Sure, you could throw them away, but we have a better idea. Put on your creative caps and turn them into one-of-a-kind, eco-chic items for your home! Perhaps in the whirlwind that is Spring Cleaning, you've encountered some towels that have seen better days. Before you throw them away, consider repurposing them as an eco-chic bath mat! The Ultimate Green Cleaning Product Roundup! If baking soda and lemon juice aren't your thing but you'd still like to avoid cleaners with a) mysterious chemicals you can't pronounce and b) warning labels that cover half the bottle, we've got the guide for you. Included below is a roundup of ten green cleaning products and companies - and why they're good for you and the space you call home. I'm a firm believer in the idea that "it's all in the details", which for our purpose today means it's all in the accessories! If you're ready to rock and roll with some hip desktop doodads, read on. ...and by "any space" I mean these babies go where you go. Kiss costly renovation goodbye, here are ten portable, clean-burning fireplaces to heat your home up now. When Jennifer Aniston got her hands on this 1970's residence, she gave it the Curbly once-over taking it from drab to eco-fab. The 6 bedroom 7 bathroom home was fitted with a bunch of solar panels and a reflective metal roof, which was meant to set an example for eco-housing real estate. The environmental lesson continues to the garden; it consists of plants that can stand up to drought. As far as the 9,000 square feet of interior goes, it's surprisingly cozy.